If you are anything like me, you might struggle in this area. My kids have only been home for the summer for 2 weeks, and I am struggling more than usual to “keep it together.” When I find myself feeling impatient with my kids or angry, there is one thing that helps me to chill out, keep things in perspective, and have more patience with children. Before you roll your eyes…bear with me for a second. What are the biggest reasons for losing patience with our kids? 1. We’re running late and they aren’t cooperating. 3. Power struggles between what we want them to do and what THEY want to do. 4. Knock down, crazy misbehavior that just pushes every button we possibly have left! etc. etc. Living in the present helps us to see life a little more through a child’s eyes rather than our own. It’s taking a second to breathe and remember WHO we are dealing with. Are we dealing with a little minion who is just trying to drive us nuts or another human being, another Child of God who is doing their best to live the life they’ve been given. Let me give you an example. Today I went on a walk with my 2 yr old. It’s part of our routine to pull out the stroller and take a quick walk to the park every morning while the older kids are gone. This morning he insisted on riding his bike instead. Because he can’t quite work the pedals well yet, our ‘quick’ morning stroll turning into a very long one. He wanted to stop every minute to point out a car, or a truck, or a bug, or a stop sign. My first thought was annoyance at how long this was going to take and how many things I needed to accomplish today. Sometimes I have to remind myself to get down off my pedestal and get down on my knees to look my child in the eyes. Try it sometime! You might find that life looks a whole lot better from down there! 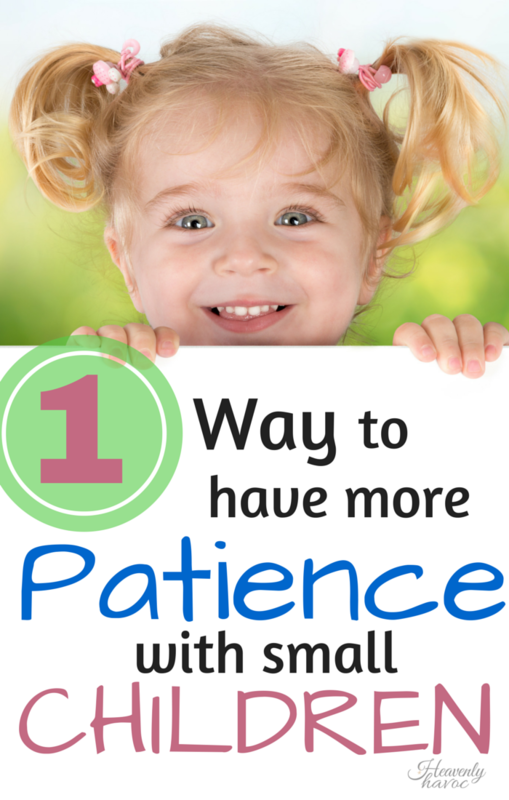 What other ideas have you found that work for getting a dose of patience?